Happy bright colours from the garden. No waste, more happiness. Here is my GUT REHAB smoothie made with fennel, radish, parsley, rose hips, dandelion root, burdock root, and red clover. The gut health is so important for people and dogs. If nearly 70% - 80% of immune system is in the gut, you probably understand what a huge impact it can give to the whole health. It affects not only the physical body but it affect the mental health too. So here is my tips how to make a gut saver AKA Fermented vegetable smoothie. Before that, think about this. We eat everyday. Well, most of us eat everyday and probably at least twice a day. So let's check how much food waste we make. I keep vegetable off cuts for our hens and dogs. And the rest goes to the compost. 2 Sprinkle the salt and massage the vegetables then toss the vegetables in the bowl. Repeat until the juice comes out. 3 Packing the salted vegetables in the sterilised glass jar. Make sure you press vegetables firm to make sure it has less surface to contact the air. 4 Put some weight and make sure to the vegetable is covered with the juice. Cover the glass jar with a clean cloth. So this fermented vegetables will make the smoothie very special. We often heard the word, probiotic. Probiotic is great for health. Probiotic is important for healthy gut system. to reduce the bacteria our body does not want. So, do you rush to the health store and get some probiotic? Whenever I feel dogs need some boost, I will add green tripe. Mother Nature has its way and she provides everything we need. Green tripe contains full of probiotic and it helps dog's digestion. When my black lab had eye infection, I fed green tripe. She did a lot better with it as it helped her body to fight agains infection. Freshness means a lot for robust immune. Enjoy seasonal food for happy healthy life! As weather is getting colder, body is getting more stiff. When the muscle is tense and stiff, it is hard to relax. When the body is warm and soft, it affects our emotion. Autumn is the time for winter preparation. Lots of berries, mushrooms, nuts as well as last blossom of roses. Take handful of wild rose petals and gently infuse in sweet aromatic virgin coconut oil. You can add this infused coconut oil in dogs daily food as well as using it for paw and fur nourishing balm. Safe to lick, beautiful to look at. There is no need to add junk. You can use this for your daily baking too so you and your dogs can enjoy it together!
. Summer is changing its appearance into Autumn. Wild black berries are getting ripe in the abundant field. When I see black berries are getting darker, I feel Autumn is nearly here. My dogs love foraging berries and I love watching them enjoying berries. Berries are great source of vitamin C, K, A and E as well as antioxidant. Please be aware that rosemary is not suitable for dogs that have epilepsy. Green tripe is so rich. so rich in real gutty smell! When I feel my dogs need a little support, I always give green tripe with green smoothie made with garlic and herbs. During the summer, I had many red clovers and meadow sweet. Red clover for clean blood. Meadow sweet for supporting digestion system. From garden to the food bowl. we see them so differently. Shall we discover the beauty of food? When I met my herbalist who is guiding me for 4 years, he told me of the importance of quality of water. He told me natural spring water has its living energy and it is far better than tapped water. As well as this important message, he told me the fact that most of people are dehydrated. People are getting very ignorant about how thirsty they are because of a busy life style. When I think about animal nutrition, I can feel the same thing is happening. Most dogs that are fed on kibble( dry food) are not able to get fresh juice of meat that has incredible nutrition. They are not able to have plenty of juice with enzyme that they could have had from prey's gut. Searching for water is a big job in wild unless they live close to river or lake. So Mother Nature prepares the way they can get juice from the prey. Now dogs are not living in wild, but live with us. So what should we do? Find good quality of spring water, put some herbs in it and leave it next to the window. After 2,3 hours, it is ready to drink. Cleaver is a famous herb that many folks are using as living detox water for spring. This helps body to detox toxin as well as clear the congestions. I also love putting mint, thyme and anything depending on the season. You can see they are actually living in the water when you leave the plant in it as it will often start rooting. They breathe in the water, releasing its vital energy in it. Enjoy this simple but incredible process that you can share with your dogs. I hope you love it just like I and dogs do! Please join us on our Face Book page. We would love to hear from you! When dogs had a big meaty bone, I give holistic smoothie as separately. It is very colorful and looks delicious. This smoothie is for hot summer. Cooling herbs and vegetables are really helpful for body to get cool down. When it is cooled down, add fruits and vegetables ( except raspberry egg and kefir). Blend with Bamix or any tools you prefer to blend. Serve it in a food bowl with a raw egg, raspberry and kefir yogurt. I use a blender called Bamix as I can make smoothie in a glass jar. No washing means no wasted water. I hope this little habit makes a difference to Mother Nature that gives so many gifts to all the creatures on this earth. I often think of what "balanced" means. Balanced diet, balanced life style and even balanced personality. For me, it is just like season we have in our beautiful nature. Spring, Summer, Autumn and Winter. None of them can not be missed and every year, it is slightly different. Balanced diet for me is eating variety of fresh food that are preferably not damaged by chemicals. Eating moderate amount, and variety. Mother Nature prepares everything we need. When I started feeding our dogs with herbs, my hope was to offer them something that they were not able to get from Mother Nature because they are living with human and their life style is so different from how they supposed to live. No hunting, nor no eating prey's guts. The life force of herbs always amazes me so that I always hope that energy will be living in body who eat them. Come and join me on Face Book! I love to hear your feedback! So here is our menu! I see lots of dandelions in a field and that makes my heart filled with happiness. Dandelion is one of the most underestimated herbs. Full of nutritions and great tonic herbs which you can harvest by yourself. 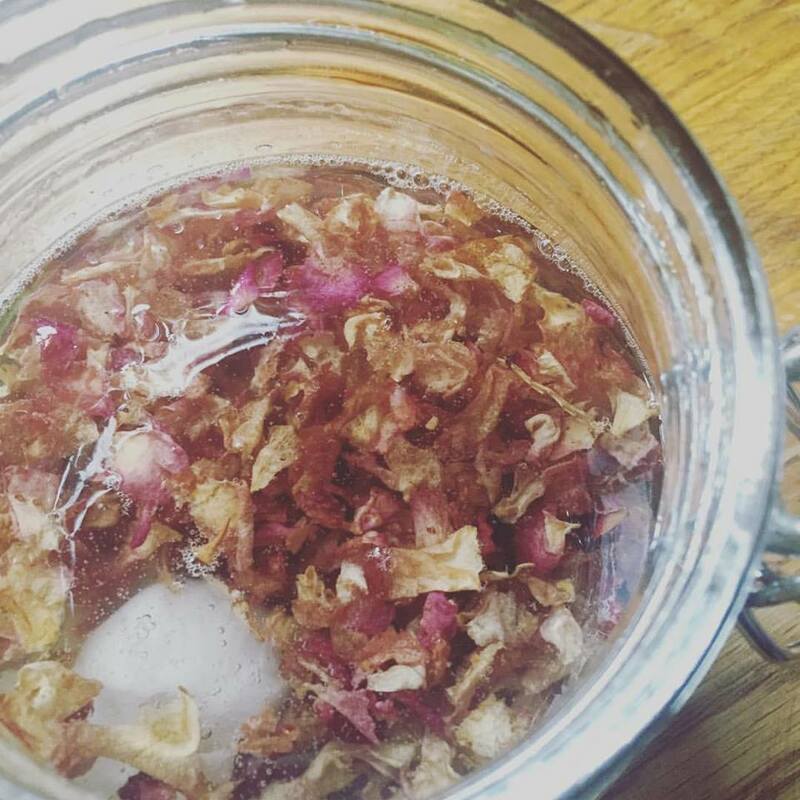 I dehydrated flowers, leaves and in winter I make a tincture from the root. So today, I made a butternut squash, carrot and dandelion smoothie. Just so bright and beautiful. I added some red clover tea and over ripe apple as well and my dogs love it so much. Shiny coat, twinkling eyes. Happy dog makes a happy human! I harvest dandelions early morning. Freshly dehydrated dandelions are so beautiful. There are field full of dandelions around my area. So bright and so beautiful. I normally harvest them in the early morning when the flowers are just opened and full of light and life force. Dandelion has a open up quality so that it helps to clear the congestions and it promotes urination. Normally in Spring, our body needs good cleansing and this plant is there to help us. When dandelions were just perfectly dehydrated, I had a delivery from organic farm. There! Now I have a great bunch of meat for dogs! You can slice the meat very thin, and sprinkle dried dandelion. Set the temperature at 35-40℃ and dehydrate until they are completely dry and crispy. Enjoy your herbal walk and making holistic treats for your dogs! Fresh ingredients make a superior bone broth. Just naturally jelly bone broth makes perfect holistic meal for your dogs! So here is our special holistic bone broth. Full of nutrition and full of collagen. 800g chicken or turkey wings, crush them with the back of a knife. 2 x 5cm square kombu / you can get whole foods or online check macrobiotic site as they often guide where you can get good quality of kombu. Put all the ingredients in a big pot and add spring water to cover. Cook with medium heat for at least 24 hours. I cooked for nearly 30 hours. You can store in a glass jar or freeze in an ice cube tray. Enjoy beautiful jelly holistic bone broth! For people to eat( dogs first, people second?!?!) , you can add some very thin slice of carrot, leek and steamed chicken and bean noodle. Cook until tender and EAT! It is a very warming and nutritious meal. Full of beauty and full of goodness! Delicious raw goat's yogurt and fresh herbs will make a delicious sauce for you and your dog. A great way to help dogs to relax. Mother Nature prepares great gifts for us. When I made a raw goat's kefir yogurt, I thought this must be very good for dogs! Kefir is great way to provide live probiotic to their digestion system. I was inspired to make this sauce after Greek tzatzik sauce. It is so tasty with beef burger and so fresh. Fresh mint is a herb that is great for dogs and it helps their digestion as well as keeping their breath nice and fresh! Oregano is a full of antioxidant and that is essential to keep their body young. So are you ready for the recipe? Enjoy raw and super healthy food! Time for detox? Here is something for you and your dogs. Here is my favorite detox water for people and animals. Now, the weather is warmer and I can easily find new shoots of cleaver. What is so amazing about cleaver? It boosts the lymphatic system so that organs can do their work properly. Yes, it is the key to balanced health. LET YOUR BODY DO ITS JOB PROPERLY! Plants take water and nutrition from the earth and transform those into their body. For me, this is not only a scientific chemical change but also an energetic transformation of life. When you put freshly picked cleavers in natural spring water, - I must emphasize that quality water is very important so make sure you use natural spring water.- it keeps breathing. It releases its life force. This living water is great for you and your dogs. Make some smoothie with this or use just as it is. Enjoy your walk with your dogs and harvest it in the morning and make living water. You can drink it by late afternoon. Here is something I have been using for our children when they have earache. When ours were small, they often had ear infections and earache. When you go to the doctor, they just hand out antibiotics. That is it. ANTIBIOTIC! I would not say this special medicine is evil but I would say, this has been used far to much and it is actually damaging our guts and all the healthy functions we have. When I came across the ear infection and earache, it made me wonder. Antibiotics won't be the answer. First, as I always say, you have to find the cause. Then treat the irritation, the symptom, while working on the cause. This beautiful mullein oil is very gentle and helpful for earache and also infection if the ear drum has not burst. So again, you have to tune into how your dog is, if s/he is well and then you can work before things get worse. I add chopped garlic to enhance the quality of this oil to fight against bacteria. It helps a lot in many cases. For earache and infection, I do believe clean blood is key. So please remember, a healthy raw diet and herbs that help to cleanse the blood are also important. Apply a few drops into the ear canal. ☆This oil is not for burst ear canal. When I prepare bone broth, I think of my grandma. She came from South Korea and in Korea, people eat slow cooked herbal chicken soap to boost their health and it is very special food. They use whole chicken stuffed with short grained sticky rice, add a couple of chinese herbs and cook them gently until the chicken becomes so tender. I loved it especially when my grandma made it. It is such a gentle flavor and very warming. And when someone is not well, people make this to show their kindness and love and hoping that special person gets better soon. So, when I realized bone broth is great for dogs, it was so natural to add some herbs for them. I cook lots of different versions of bone broth but this one is very easy. I put all the ingredients in spring water ( not tap water) and gentle cook. I cook at least 24 hours but sometimes longer. The amazing thing about bone broth is, you can get such deep nutrition from bones and it's easy for dogs to take it in. It nourishes their immune system as well as helps the liver to detox to clear the body. What is your favorite bone broth? Here is our menu today for our pooches. I love feeding meaty bones as it is a good exercise and ideal proportion for dogs. I added green tripe for Coco the black lab as she needs more than just one quail. So here is Coco's meal.